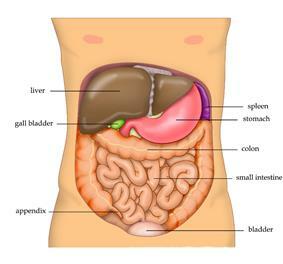 The liver is a vertebrates and some other animals. In the human it is located in the upper right quadrant of the abdomen, below the diaphragm. The liver has a wide range of functions, including detoxification of various metabolites, protein synthesis, and the production of biochemicals necessary for digestion. The liver is a homologous it is to the vertebrate liver. Human liver.Visceral surface of liver. ^ a b TortoraDerrickson 2008, p. 945. ^ a b c Marieb & Hoehn 2012, p. 881. ^ a b Marieb & Hoehn 2012, p. 939. The liver is found in all snakes, where the shape of the body necessitates a simple cigar-like form. 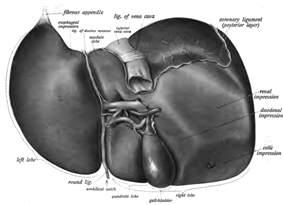 The internal structure of the liver is broadly similar in all vertebrates. In the motion picture The Message, Hind bint Utbah is implied or portrayed eating the liver of Hamza ibn ‘Abd al-Muttalib during the Battle of Uhud. Although there are narrations that suggest that Hind did "taste", rather than eat, the liver of Hamza, the authenticity of these narrations have to be questioned. In divination called haruspicy, where they tried to obtain information by examining the livers of sheep and other animals. Liver transplant usually come from donors who have died from fatal brain injury. Living donor liver transplantation is a technique in which a portion of a living person's liver is removed and used to replace the entire liver of the recipient. This was first performed in 1989 for pediatric liver transplantation. Only 20 percent of an adult's liver (Couinaud segments 2 and 3) is needed to serve as a liver allograft for an infant or small child. Diseases that interfere with liver function will lead to derangement of these processes. However, the liver has a great capacity to regenerate and has a large reserve capacity. In most cases, the liver only produces symptoms after extensive damage. There are also many pediatric liver diseases, including biliary atresia, alpha-1 antitrypsin deficiency, alagille syndrome, progressive familial intrahepatic cholestasis, and Langerhans cell histiocytosis, to name but a few. Other disorders caused by excessive alcohol consumption are grouped under alcoholic liver diseases and these include alcoholic hepatitis, fatty liver, and cirrhosis. Liver damage can also be caused by drugs, particularly paracetomol and drugs used to treat cancer. The liver supports almost every organ in the body and is vital for survival. Because of its strategic location and multidimensional functions, the liver is also prone to many diseases.The bare area of the liver is a site that is vulnerable to the passing of infection from the abdominal cavity to the thoracic cavity. The oxidative capacity of the liver decreases with aging and therefore any medications that require oxidation (for instance, benzodiazepines) are more likely to accumulate to toxic levels. However, medications with shorter half-lives, such as lorazepam and oxazepam, are preferred in most cases when benzodiazepines are required in regards to geriatric medicine. The liver stores a multitude of substances, including glucose (in the form of glycogen), vitamin A (1–2 years' supply), vitamin D (1–4 months' supply), vitamin B12 (1–3 years' supply), vitamin K, iron, and copper. The liver is responsible for immunological effects—the reticuloendothelial system of the liver contains many immunologically active cells, acting as a 'sieve' for antigens carried to it via the portal system. The liver is responsible for the breakdown of insulin and other hormones. The liver breaks down bilirubin via glucuronidation, facilitating its excretion into bile. The liver is responsible for the breakdown and excretion of many waste products. It plays a key role in breaking down or modifying toxic substances (e.g., methylation) and most medicinal products in a process called drug metabolism. This sometimes results in toxication, when the metabolite is more toxic than its precursor. Preferably, the toxins are conjugated to avail excretion in bile or urine. The liver breaks down ammonia into urea as part of the urea cycle, and the urea is excreted in the urine.insulin-like growth factor 1 (IGF-1), a polypeptide protein hormone that plays an important role in childhood growth and continues to have anabolic effects in adults. The liver is responsible for the mainstay of protein metabolism, synthesis as well as degradation. It is also responsible for a large part of amino acid synthesis. The liver plays a role in the production of clotting factors as well as red blood cell production. Some of the proteins synthesized by the liver include coagulation factors I (fibrinogen), II (prothrombin), V, VII, VIII, IX, X and XI, as well as protein C, protein S and antithrombin. In the first trimester fetus, the liver is the main site of red blood cell production. By the 32nd week of gestation, the bone marrow has almost completely taken over that task. The liver is a major site of production for thrombopoietin, a glycoprotein hormone that regulates the production of platelets by the bone marrow. The liver receives a dual blood supply from the arterial blood to the liver, accounting for the remaining quarter of its blood flow. Oxygen is provided from both sources; approximately half of the liver's oxygen demand is met by the hepatic portal vein, and half is met by the hepatic arteries. The various functions of the liver are carried out by the liver cells or liver dialysis, an experimental treatment for liver failure. At birth the liver comprises roughly 4% of body weight and is at average 120g. Over the course of development, it will increase to 1,4–1,6 kg but will only take up 2.5–3.5% of body weight. After birth, the umbilical vein and ductus venosus are completely obliterated in two to five days; the former becomes the ligamentum teres and the latter becomes the ligamentum venosum. In the disease state of cirrhosis and portal hypertension, the umbilical vein can open up again. human embryogenesis. The origins of the liver lie in both the ventral portion of the foregut endoderm (endoderm being one of the 3 embryonic germ layers) and the constituents of the adjacent septum transversum mesenchyme. In the human embryo, the hepatic diverticulum is the tube of endoderm that extends out from the foregut into the surrounding mesenchyme. The mesenchyme of septum transversum induces this endoderm to proliferate, to branch, and to form the glandular epithelium of the liver. A portion of the hepatic diverticulum (that region closest to the digestive tube) continues to function as the drainage duct of the liver, and a branch from this duct produces the gallbladder. Besides signals from the septum transversum mesenchyme, fibroblast growth factor from the developing heart also contributes to hepatic competence, along with retinoic acid emanating from the lateral plate mesoderm. The hepatic endodermal cells undergo a morphological transition from columnar to pseudostratified resulting in thickening into the early liver bud. Their expansion forms a population of the bipotential hepatoblasts. Hepatic stellate cells are derived from mesenchyme. Unit I is the caudate lobe and is situated posterior l and it may receive its supply from both the right and the left branches of portal vent. It contains one or more hepatic veins which drain directly into the IVC. The central area or hilum, known as the porta hepatis is where the common bile duct, hepatic portal vein, and the hepatic artery proper enter the liver. The duct, vein, and artery divide into left and right branches, and the areas of the liver supplied by these branches constitute the functional left and right lobes.The functional lobes are separated by the imaginary plane, Cantlie's line, joining the gallbladder fossa to the inferior vena cava. 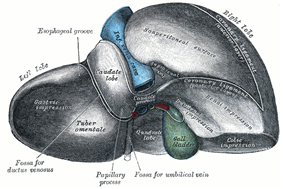 The plane separates the liver into the true right and left lobes. The middle hepatic vein also demarcates the true right and left lobes. The right lobe is further divided into an anterior and posterior segment by the right hepatic vein. The left lobe is divided into the medial and lateral segments by the left hepatic vein. Histology, the study of microscopic anatomy, shows two major types of liver cell: parenchymal cells and non-parenchymal cells. 70–85% of the liver volume is occupied by parenchymal hepatocytes. Non-parenchymal cells constitute 40% of the total number of liver cells but only 6.5% of its volume. The liver sinusoids are lined with two types of cell, sinusoidal endothelial cells, and phagocytic Kupffer cells. Hepatic stellate cells are non-parenchymal cells found in the space of Disse, between a sinusoid and a hepatocyte. Additionally, intrahepatic lymphocytes are often present in the sinusoidal lumen. Microscopically, each liver lobe is seen to be made up of hepatic lobules. The lobules are roughly hexagonal, and consist of plates of hepatocytes radiating from a central vein.portal triad, which can be found running along each of the lobule's corners. The portal triad, misleadingly named, consists of five structures: a branch of the hepatic artery, a branch of the hepatic portal vein, and a bile duct, as well as lymphatic vessels and a branch of the vagus nerve. Between the hepatocyte plates are liver sinusoids, which are enlarged capillaries through which blood from the hepatic portal vein and hepatic artery enters via the portal triads, then drains to the central vein. The falciform ligament, visible on the front of the liver, divides the liver into a left lobe and a much larger right lobe. From the visceral surface, the two additional lobes are located between the right and left lobes, one in front of the other. A line can be imagined running from the left of the vena cava and all the way forward to divide the liver and gallbladder into two halves. This line is called Cantlie's line. 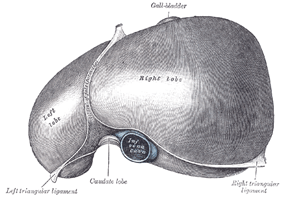 Gross anatomy traditionally divided the liver into two portions– a right and a left lobe, as viewed from the front (diaphragmatic) surface; but the underside (the visceral surface) shows it to be divided into four lobes and includes the caudate and quadrate lobes. Lobules are the functional units of the liver. Each lobule is made up of millions of hepatic cells (hepatocytes) which are the basic metabolic cells. 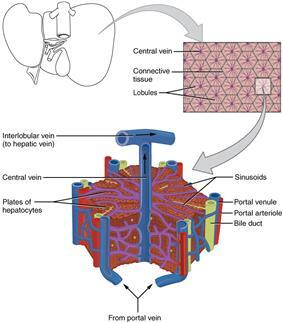 The lobules are held together by fine areolar tissue which extends into the structure of the liver, by accompanying the vessels (veins and arteries) ducts and nerves through the hepatic portal, as a fibrous capsule called Glisson's capsule. The whole surface of the liver is covered in a serous coat derived from peritoneum and this has an inner fibrous coat (Glisson's capsule) to which it is firmly adhered. The fibrous coat is of areolar tissue and follows the vessels and ducts to support them. The liver is connected to two large blood vessels, the hepatic artery and the portal vein. The hepatic artery carries oxygen-rich blood from the aorta, whereas the portal vein carries blood rich in digested nutrients from the entire gastrointestinal tract and also from the spleen and pancreas. These blood vessels subdivide into small capillaries known as liver sinusoids, which then lead to a lobule. 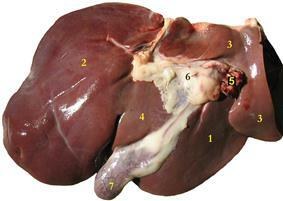 The liver is a reddish brown wedge-shaped organ with four gland in the human body. Located in the right upper quadrant of the abdominal cavity, it rests just below the diaphragm, to the right of the stomach and overlies the gallbladder. There is currently no way to compensate for the absence of liver function in the long term, although liver dialysis techniques can be used in the short term. Liver transplantation is the only option for complete liver failure. Terminology related to the liver often starts in hepar- or hepat- from the Greek word for liver, hēpar (ἧπαρ, root hepat-, ἡπατ-).